Okay, so back in-the-day when I was very young and designing shoebox homes for my collection of ladybugs and caterpillars, I made the same mistake as many homeowners are making today. Yes, you know you do … You come home from the paint store with your shiny new sample of what you think will be the perfect paint. And then what do you do? You slap it up on the wall right over the existing paint, right? Wrong. I guarantee that the paint you are seeing on the wall now is not what you will be seeing after you complete the project, and here’s why: In order to see the true undertones, (a color that’s present, but not always obvious depending on the lighting and what other colors surround it), you must paint your sample onto a white board and leave lots of white edges around it. Or, if you MUST slap paint on your wall, tape white paper all around your Picasso so it has plenty of white edge. 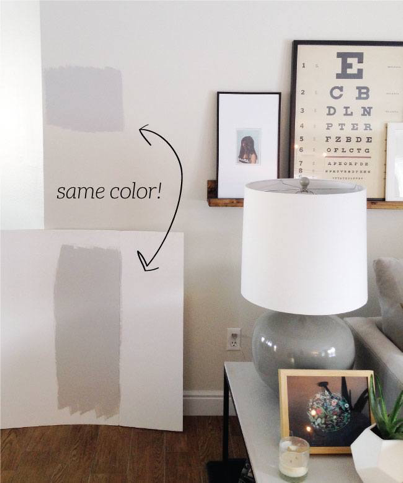 If you don’t add white around the edges you will be comparing your new paint sample to the old paint color on the wall and that is not an accurate representation at all. See how much more gray the color on top is compared to the accurate color on the white board? By using a white board you can also move your paint sample around the room, to dark corners, behind the sofa, next to stone on fireplace … Also, move your board around in the morning, afternoon and evening to really see what you are working with. Shadows change colors immensely! Take your time, paint your boards, and do it right the first time around! PREVIOUS POST: Can You Afford an Interior Designer?